This post was written for the Cherished Blog Fest 2017. I immediately knew what I wanted to share this year. The swimming pool has always been a place for our family to gather and have fun together. And though I’m not a great swimmer – my dogs have all believed through the years that I’m about to drown and have taken measures to save me – I have treasured memories of time spent in a swimming pool. Though the swimming pool has changed – once because I moved and then because of renovations – it stayed the place where memories are gathered. The most recent, and bittersweet, of those memories are about Emmett. Regular readers will know that I lost him in December 2016. I even wrote a short story about my loss (which, in its Afrikaans version was published early this year in the Inkspraak anthology). Emmett loved swimming. He started swimming because he jumped in after me (he thought I was drowning) and pulled me to the pool’s steps. We would race the length of the pool (he always won and swam back to get me), we would swim late on summer nights when we were supposed to be sleeping, and he taught Cal and Tony how to swim even though he was riddled with cancer. We can talk about the aggressive bone cancer that claimed his life in only six weeks. We can talk about how Emmett and I sat on the pool’s top step the day before he died, when he was too weak to swim because the cancer had metastasised to his lungs. We can talk about how hard it’s been to go swimming ever since. We can talk about the great excuse winter brought to stay out of the swimming pool. We can talk about how it felt losing my best friend and beta reader (he always whined when things didn’t sound right). But I’d rather leave you with this picture. *The words on the photo of Emmett came from Pinterest, though I have no idea who wrote it. It felt fitting, though. Do you like to go swimming? 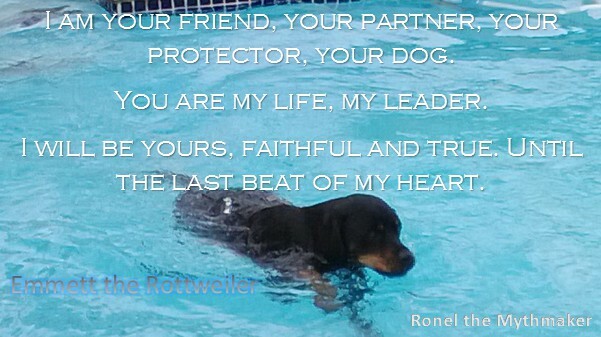 Have you swam with your dogs? Oh that is wonderful. My chest tightened just reading that. I love my dog.